The Thanksgiving Partners Program is working to pair Emory faculty and international students to celebrate the holiday in an American home. Interested faculty and students may sign up by Nov. 17. 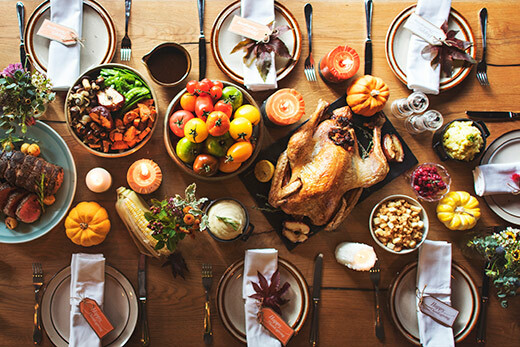 The Thanksgiving Partners Program seeks to pair Emory faculty and international students to celebrate the American holiday in an American home. Students Ali Murad Buyum 19C and Vicky Wang 21C are leading the program through the International Student Leadership and Advocacy Board (ISLAB) in Campus Life's Student Involvement, Leadership and Transitions (SILT). The deadline for faculty sign-ups and student sign-ups is Friday, Nov. 17.
International students often cannot go home during the Thanksgiving holiday due to financial situations and because it is a relatively short break followed shortly by end-of-semester academic work and finals. For years, the Emory Alumni Association and the former Office of International Student Life partnered to link international students with local Thanksgiving hosts in the Emory community. After that program lapsed, ISLAB leaders decided to organize this year's event so that current international students have an opportunity to experience a traditional American Thanksgiving, according to Rick Huizinga, SILT'S program coordinator for international student life. The impetus grew out of experience and input from students, says Buyum, a biology and French major on the pre-med track. A lot of international students, says Wang, have heard of Thanksgiving. “They are familiar with the concept and know it’s a traditional experience," she notes. As the Nov. 17 deadline approaches, Buyum and Wang say both faculty and students are signing up. The committee, which also includes Monica Chen and Agnes Zhang, wants enough time to pair host faculty with student guests. To aid in the process, committee members created Google forms designed to pair hosts and guests with similar needs. Questions for faculty hosts include how many guests they are able to welcome and whether they can supply transportation; student guests are asked about issues like dietary restrictions and food or pet allergies. For the first year of the revitalized program, organizers are reaching out to both faculty and students through Facebook, the OISL newsletter and Emory emails primarily. They also sought out departments in Emory College of Arts and Sciences, Goizueta Business School and the Nell Hodgson Woodruff School of Nursing. Buyum sees the Thanksgiving Partners Program as an opportunity to initiate discussions on culture, which encompasses gastronomy, traditions and customs, and bring awareness on both sides. He also says the 15-member ISLAB is designed to empower international students on campus by seeking to create multiple new events to give the international students exposure to American culture. “We want to break the stereotypes of international students as being shy and unapproachable and expose them to American culture,” she says. For more information, contact Rick Huizinga, ISLAB adviser.